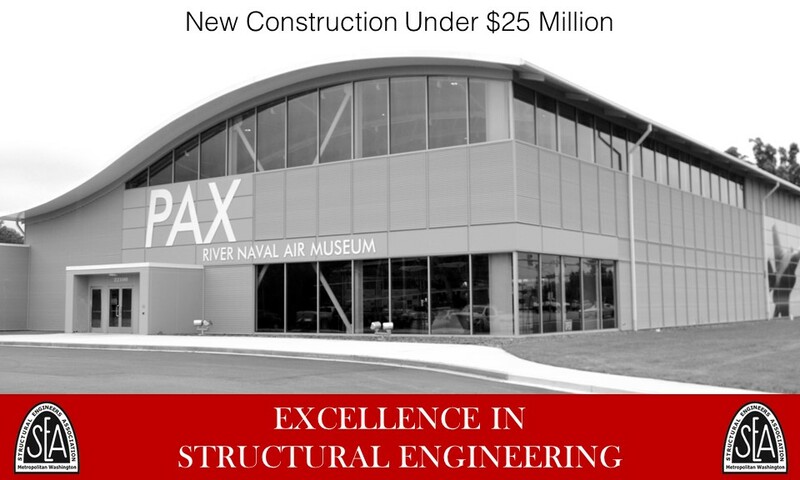 As the only Naval museum dedicated to aviation research, development, and evaluation, the 15,000 square foot (SF), column-free area allows for complete flexibility of the museum’s displays, including aerial vehicles and artifacts. The 95-foot, curving, long-span steel roof trusses facilitate this unobstructed space and provide a unique, aesthetically graceful design. A sliding hangar door was incorporated to allow for easy rotation and movement of large displays including full size aircraft. Secondary steel framing around the museum perimeter provides support for the glass façade. The gift shop, offices, and mechanical, electrical, and plumbing spaces are located within a 2-story section of the museum and are supported by structural steel framing. With energy efficiency a key element of the design, thermal break connections were designed at the truss ends to reduce thermal conductivity across the building envelope.